Disclosure: I received a sample to help facilitate the review. All opinions stated are genuine and my own. where you can enter to win one too! The idea of turning your shower into a spa sounds appealing, doesn't it?!?! With Essio that's exactly what you can do. Featured on 'The Doctors', and in People, DaySpa, Modern Beauty and more, this fabulous kit allows you to experience a full-body experience with the aromatherapy oils that diffuse right into your warm shower water. The all-natural oils are 100% organic and can be adjusted in the shower to offer a little, or a lot. No need to worry about sticky residue on your hair or skin being left behind, because there is none. And the cool thing is, you can use it any time you want (or not) by simply tilting the container up or down while it is attached to your shower head. Installation is a cinch, but make sure you have a standard mounting bar on your shower head so it can snap firmly in place. Remove your pod of choice from the case, take off the cap, and push until you hear a snap. Turn clockwise until it locks into place. The arm is adjustable, and the pod container will tip up and down to vary the amount of scent you like in your shower. 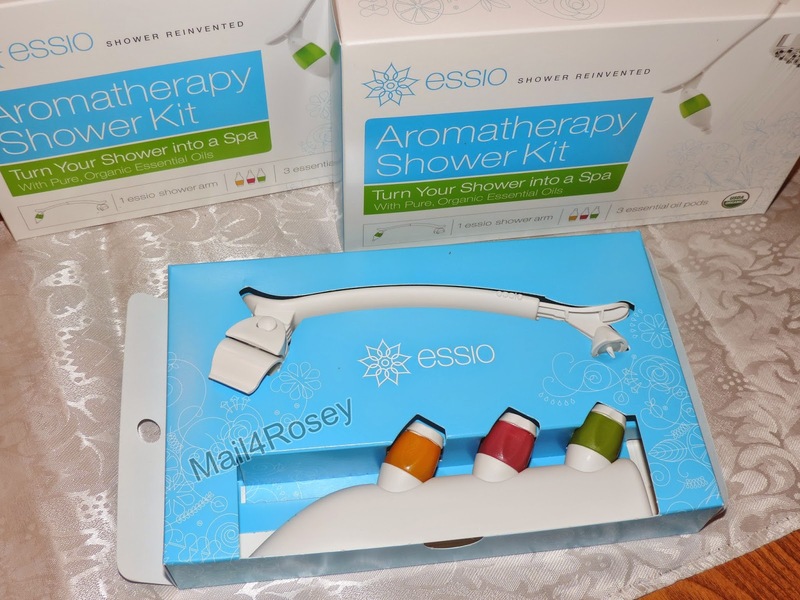 I have been really wanting to jump in and try the essential oil experience so many have been raving about, and I can't think of a better way to do it than through ESSIO's Aromatherapy Shower Kit! Below are some facts offered through the company. ESSIO is a unique system that transforms the shower into a personal spa by infusing the warm moving water of the shower with aromatherapy oils selected for their beneficial effects on the mind and body. It is an affordable luxury and a great gift item too. Who wouldn't want a spa in the comfort of their shower? The attachment arm clips onto the standard shower pipe that is in most showers. The pod is easily attached by removing the cap and twisting onto the attachment arm. It should take no more than 1 minute to get the entire starter kit set up, and with no tools. The oil does not spray into the shower. It is diffused using patented technology that leaves no oily residue on the skin or hair. Aromatherapy is an ancient therapeutic practice with many benefits including improved mood and energy, reduced inflammation, increased blood circulation, improved skin tone and reduced stresss. ESSIO aromatherapy blends are crafted by master aromatherapists using only the highest available grade botanical essences, and contain no synthetic fragrances or any other artificial ingredients. ESSIO has 6 unique combinations of 100% therapeutic-grade organic essential oils, each designed with a specific mind/body benefit. You can also follow ESSIO on Facebook, Twitter, and/or Pinterest. Enter the ESSIO one week giveaway below (ends 2/11). Enter the ESSIO giveaway I am hosting here (ends 2/23). My wife would like it, but with my luck, I'd forget it was on and spa myself. What a great idea. I'd like this a lot. Sounds luxurious, and who couldn't use a little luxury in their lives? That thing looks awesome! I could definitely use this after a long day of VAing. I wouldn't mind this right now! It sounds perfect after a looong tiring day at work. hi Rosey! I am BACK. Thanks for your sweet holiday wishes over the months. You are fabulous! Thanks for being so nice ♥! This is pretty neat. I want one for my shower. I am a huge fan of essential oils. This looks like a great product. I'm thinking that I need this in my shower. I love taking long baths and showers and this would just make my experience so much better. That would be the perfect gift for Valentines Day. The problem is... I would never want to get out of the shower. So... where is the picture of you in the shower anyway???? I wouldn't get out of the shower either. At least until the water got cold. Wow!!! That is a really neat product that I have not seen before! Someone's gonna make some money off that one, for sure! I've never seen anything quite like that. Very neat idea! I love that this doesn't leave any oily residue on your skin! A spa-like shower sounds heavenly on a cold winter day like today. Ooh, who wouldn't like a spa treatment in their shower? I would love one of these! I would love to have one of these-it sounds like heaven. I would love this...in fact, I would LOVE to redo my ENTIRE bathroom! lol! Oh wow I would love this! Sounds like a pretty great addition to any bathroom! I'm sure ours could really use it! I have always wanted to try aromatherapy. In the shower would make it super relaxing. I would love this so much! My shower is so weak and powerless. I stand there and shiver some mornings! I really need this for my stressful days. It sounds heavenly! How awesome to turn your shower into a spa. I would love to win this for sure. This looks like a nice way to unwind while at home. This would be a good win. I love this idea! Nothing I love more than a spa! This is awesome! I totally need this for my house! My fellow beauty blogger sisters are all over these. Looks like I really need to check them out. This winter seems to be dragging I would love some spa treatment at my own home. It sounds like it would really make it spa-like in there, and who doesn't want that? It's also nice to know it doesn't leave an oily residue. Oh I am seriously going to put this on my wishlist! I would love thy dose of aromatherapy at the end of the day!! This is such a great idea. I want this in my shower! What a great inventions! Who doesn't want to be pampered? Oh, love that! This is such a great idea! What a great idea, I'd really like to have a spa shower too! I am totally picking up this Essio product! I really, really need this to relax! What an interesting product... I suspect I'd enjoy that one. If given a chance to redesign our bathroom, I would want it to be like a spa. This way, everyone in the family can feel more relaxed inside the home. We dont need to go outside to feel like in a resort or somewhere far. What a neat idea. I bet these smell really good too! Are they oily and do they leave the bottom of the shower oily, just wondering about slipping. I love this idea! That looks absolutely heavenly. I'd be tempted to hog the shower all the time in that case. I can't believe there hasn't been a product like this before... such an awesome idea. Love it! I looooove essential oils. I really could use this in my life. Going to have to check out their website. Showering would be a treat with that! Very cool giveaway. This looks awesome! I would love to try it. I have wanted one of these for a while. I love aromatherapy in the shower. I believe everyone can benefit by the power of aromatherapy! I like what Pat Hat said. We can all use a good pampering - I totally agree and would love to give this a try! I love this! My daughter and I were just talking about something similar. She has a bad cold and had made some homemade shower bombs with eucalyptus. This would make a great gift for her. This looks awesome. Particularly when you are dead tired & want some relaxation, then this would be a great choice to go for. I would love to get one such kit for my shower. Wow! The last time I was in a spa was three years ago and it was a freebie. Would love to have that pampering again in the comfort of my own home. That is awesome! It looks so awesome! I would definitely love to have this kit and pamper myself all the time! What a great idea! Thanks for the great review and the chance to win our own! What a great way to relax and pamper yourself -- without spending a gazillion dollars at the spa! I've never seen anything like it, it's a great idea! This is neat. Love to have one. Thanks for the awesome giveaway. Hope I win! This sounds like a great addition to the shower! I have always wanted to have a spa-like shower head. I think it would be so relaxing to have. I like how you clarified that no oily residue is associated with the use of this item. This looks amazing. I have a terrible cold right now and I bet this would help. What an awesome idea. So clever. We are looking to swap out our shower head for a new one. We will look into this one. What a fancy, relaxing shower! That sounds wonderfully relaxing! Sign me up. Haha! Oh yes this sounds like much needed escape when I can get a shower! That sounds fantastic. I would never come out of the shower. This looks like an awesome Valentine's day gift, that I'd be THRILLED to receive! I'll have to find a way to drop my husband a hint or two, lol. I've been wanting to hear about this, I'm thinking of try it out. What an interesting concept! I have a friend that would absolutely love this. It would never have occurred to me that you could do this at home, but it looks really easy to set up. I so thought about giving this a try but it doesn't work on my shower. I wish it did though. what a fun thing to give a try. Hmmm, I wonder if this would work in my shower. Essential oils are so nice for relaxing. This is exactly what I need in my life right now! That is so cool! I love essential oils so I would love to try them in the shower. What a great idea. I think I need this! Oh these look so cool. I definitely want one. Thanks for the giveaway. Oh my! This sounds like something I would like to have installed in our bathroom! Spa during bath time sounds very relaxing. Wow! This is cool! I would have never known there was something out there like this. I'm not sure how often I would use it - but it is definitely something I would look into. I want one of these! So cool! Wow, I bet this would be wonderful in the shower. What a unique concept but really perfect when you think about how popular essential oils are. I have had my eye on Essio since the holidays, when they ran an awesome Black Friday and Cyber Monday promotion that I regrettably didn't get in on. It sounds like an awesome little gadget, though! Who wouldn't want to turn their shower into a spa!? What a great way to get a spa treatment at home. I like that it's easy to attached and use whenever you need it. I could really use one of these!! !